You’ve spoken about how Hate Eternal’s music is largely inspired by your own personal tragedies, and how you’ve pushed the band to reach a new level of expression. What do you think was your greatest achievement with Upon Desolate Sands? I would have to say everything really. I am so pleased with how UDS came out. From the songwriting to the performances to the tones on the album to the length and song order of the record to the production. It is one of my proudest moments as a musician and a producer and a defining moment for me in many ways. There is so much depth and character to this album and exemplifies our music in a very dynamic way. We put everything we had into this album and I believe it shows. Very proud. Do you feel that Upon Desolate Sands reached a pinnacle or did it open a beginning for blazing new trails through uncharted territory? I feel like we reached a place we never have before but are now opening new territory to explore going further on future albums which is very exciting. We are always trying to push the boundaries and dynamics of our music. I feel like we have so much more to offer in the future, we are just beginning to touch the surface. I feel that way after every Hate Eternal album as I feel we progress deeper and further as we continue onward. 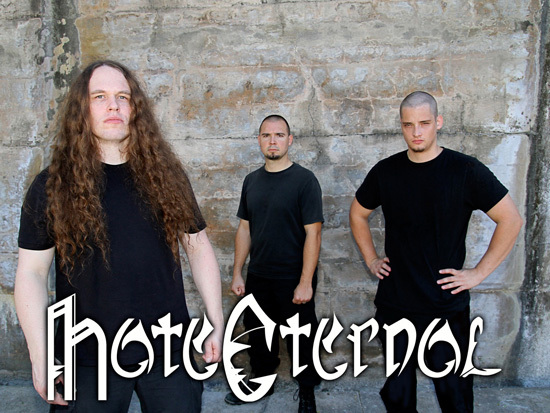 Does the name Hate Eternal have anything to do with people’s struggles to get beyond tragedies? In a way it does for sure. I have endured much in my life and struggled to deal with the events and the emotions that it created. That is how I found music. Anger, grief, sadness, angst, rage…. I have been fortunate to be able to express all of my negative emotion though music and it has been so helpful and therapeutic in my life. Music saved me in so many ways and has helped create a life for me that has been so rewarding and humbling. Music is my lifesblood. I cannot imagine where I would be without music. I am very grateful that my passion has gotten me to where I am in life and helped me through the darkest times. Your lyrics speak of legend and ancient lore that brilliantly transport people beyond the physical realm as do the instruments. Overall, what do you want people to feel, experience and gain from your music? I want people to take the musical journey that is Hate Eternal. As to reach the depths within themselves, having our music and lyrics conjure something inside them to understand and comprehend life and pain and emotion. So much of what I write is a metaphor for something much darker and deeper. The music and lyrics come from a very dark place of depth. I think people can feel that hence why some people are afraid to dive deep into our music or they just do not understand it or comprehend it. Our music speaks to many people and yet some I guess will never understand which is OK. Hate Eternal is not meant for everyone. Writing music and lyrics is an extension and expression of who we are. What is it like for you to have this incredible vision and talent as both musician and producer, where you tap into the pulse of a band and maintain its uniqueness while working to enhance both sound and delivery? Is stopping to understand a bands message key in that process? I feel music in such depth and I can hear the details behind it. I understand so much of what goes into music from all of my experience in music and in life. I feel very grateful to have had an upbringing in music from a young child which has helped me feel and hear the purity of music. Comprehending the band’s musical direction and what lies behind the music and lyrical approach is key to achieving their sound on an album. I am always trying to bring out the band’s individual and collectively unique sound. That is ultimately my goal for each album and each band. To capture the authenticity of the band and their performances and their sound. You’ve expressed a difference between digital and live music. Do you ever experience that a person’s spirit and emotional energy that is poured into the music while they are playing it makes a huge difference in that outcome? If I understand the question properly I believe music represents their spirit and energy and capturing that is super essential to realizing their potential as an artist and a musician. I guess that is why I always try to capture authentic performances and push musicians to the limits to give all they have into all we do. What were some of the most powerful influences Iron Maiden or other bands had on you that inspired your creativity? Iron Maiden changed my life in is many ways. So did Judas Priest, Ozzy, Metallica, Slayer etc… Those bands really shaped who I am today as a musician. Classical music also played a huge part in my life from a young age. I know without that I would not be the musician I am today. Clearly, you throw so much of yourself into your music; your thoughts, feelings, soul. time, effort, detail, energy. Does it ever feel like you’ve created another world that means “everything” to you? Music completely transports me to another world, another dimension of sorts. It transcends everything yet also embodies everything of who I am, who I was and what I am to become. Music has given me so much in my life and enriched it beyond my wildest imagination. I am so fortunate to be so connected to creating music. It is so much a part of who I am. If so, do you ever transport there yourself while you are playing on stage? Absolutely!! Man, when I am writing or playing music or on stage I am in another universe! I just love composing and playing so much. It is an absolute pleasure and honor to be able to write music and record it and then perform for the masses. I feel very grateful for all I have been able to do in my life and career mostly centered on music. 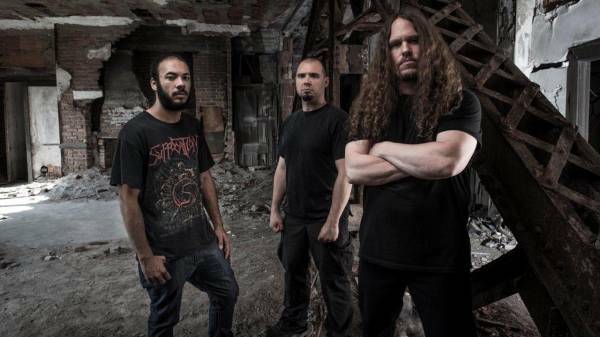 Is there anything that you want to achieve for Hate Eternal in 2019 and beyond? Would like to tour and play our music of new and old and also start write and compose many more Hate Eternal albums!